With eight Rounds in the books for 2013, here is a look at the current leaderboard in the The @NRLTweet Player of the Year Awards. That's not a typo, Shaun Johnson sits 2nd with 26 votes after 8 rounds. And yep, the Warriors have just two wins over that same period. But the truth is Shaun Johnson has actually played well in a poor team this season, collecting 3 Man of the Match Awards in Round 2 against the Roosters, Round 4 against the Cowboys and Round 8 against the Titans (that is two voters gave him the maximum of 4 Votes in a single game - more on how votes are allocated below). The way the #NRLTweetPOTY Awards are structured means that if you are the best player on the field you gain a big advantage on the players who are solid every week, but don't always turn a game on its head or win it for their team. That is because the most votes a player can gain in a match is 8 Votes (2 voters per game hand out 4-2-1s), while a player who is only the second or third best on the field can only gain a maximum of 4 votes (if they don't get a single Man of the Match vote). This way the best players who win games for their team are recognised as much as possible, because after all a team only needs about 12 wins a season to make the Finals - and players that contribute heavily to those victories deserve total recognition, versus players who are solid all year but don't actually shift the balance of power in games and their teams fail to fire on the competition ladder. Because remember - we play to win the game, not just to be competitive. Turning attention back to Shaun Johnson and his 2nd spot - it has been fairly obvious in 2013 that he has looked like the Warriors only avenue to points in 2013, so when they actually play half decently - odds are he's behind that form turnaround. The good news for those thinking 'What are these voters on?' is that Melbourne's Cooper Cronk is still 5 votes in front of Johnson, and a host of standouts from Season 2013 to date. Cronk - like Johnson - has 3 Man of the Match Awards (Round 1 v St George Illawarra, Round 2 v North Queensland and Round 6 v South Sydney) and has picked up votes in every other round bar Round 5 and 8. The classy halfback has been the best of Melbourne's Big Three - however Billy Slater isn't that far behind him with 23 votes and although Cameron Smith has just 8 total votes - a measure of his quality is that he has votes in 5 of his 8 games so far. The Storm duo sit in 1st and 4th after 8 Rounds, with Cronk starting the year off with 22 points in 4 rounds, while Slater picked up 22 points from Round 3-5. Johnathan Thurston sits in 3rd on 25 votes, with a Man of the Match performance in Round 1 v Canterbury and again in Round 5 against the Panthers. After Slater in 4th comes a fairly handy footballer in Sonny Bill Williams who has only one Man of the Match maximum in Round 4's romp over Parramatta but so strong has his influence been that he has registered votes in 5 of his last 6 games. 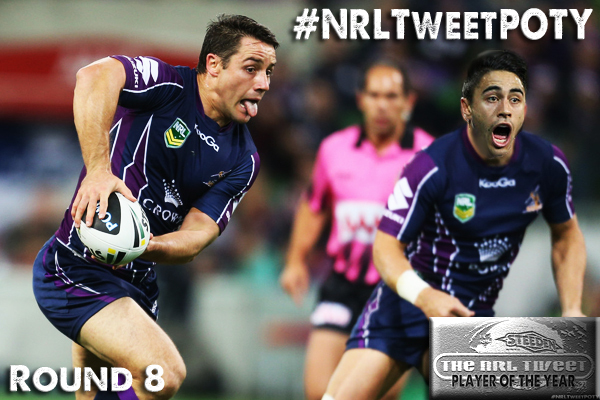 SBW is 5th on the #NRLTweetPOTY Leaderboard and 9 points behind Cronk. St George Illawarra's Trent Merrin 6th place position suggests he is waging a one man war on behalf of the Dragons with 21 votes, while South Sydney's presence in the Top 10 comes from Greg Inglis (7th) and Adam Reynolds (8th) with 21 and 20 votes respectively. So good have the Rabbitohs been that Sam Burgess and John Sutton sit in 14th and 15th with 16 points each. Rounding out the Top 10 is Newcastle's Jarrod Mullen with 18 points and Brisbane's Ben Hannant with 18 points (including two Man of the Match Awards in Round 2 v St George Illawarra and Round 6 v North Queensland). James Maloney also sits on 18 points but has just one Man of the Match - Round 6 v Canterbury. For those playing the NSW five-eighth game at home - Maloney's 18 points lead Cronulla's Todd Carney by 5 votes (with all of Carney's 13 votes coming in the first 3 rounds). So do you think Johnson deserves to be so high? Any players you think aren't rated highly enough? How Votes are awarded is explained below. BRI: 19 - B Hannant, 10 - J Hodges, 8 - A McCullough, 7 - J Hoffman, 4 - C Norman, 3 - M Gillett, 2 - J Reed, C Parker, 1 - S Thaiday. CAN: 10 - R Robinson, 8 - B Ferguson, S Fensom, 6 - D Shillington, J Croker, 5 - T Learoyd-Lahrs, 4 - S Williams, 3 - T Campese, J Wighton, 2 - E Lee, 1 - J Edwards. CBY: 15 - J Reynolds, 8 - J Jackson, 6 - J Morris, 5 - T Lafai, 3 - D Low, J Graham, 2 - M Brown, S Perrett. CRO: 13- L Lewis, T Carney, 10 - P Gallen, 3 - A Tupou, 2 - N Stapleton, J Robson, 1 - J Bukuya, M Gordon. GLD: 14 - N Myles, 12 - G Bird, 7 - A Sezer, A Kelly, 6 - L Bailey, 5 - J Idris, 4 - W Zillman, 1 - M Srama. MAN: 14 - J Lyon, 10 - A Watmough, 9 - S Matai, J Taufua, 8 - J Horo, D Cherry-Evans, B Lawrence, 4 - M Ballin, T Symonds, K Foran, 3 - B Kite, B Stewart, 2 - D Williams. MEL: 31 - C Cronk, 23 - B Slater, 8 - C Smith, W Chambers, 3 - R Hoffman, G Widdop, 1 - J Ryles, J Bromwich. NEW: 18 - J Mullen, 10 - J McManus, 8 - T Roberts, 7 - D Boyd, 6 - A Uate, D Gagai, 5 - K Snowden, 4 - C Houston, 2 - K Gidley, 1 - W Mason, D Fa'alogo. NQL: 25 - J Thurston, 15 - M Scott, 5 - J Tamou, 4 - T Sims, 2 - M Bowen, 1 - A Graham, K Linnett, A Winterstein. PAR: 12 - C Sandow, 8 - T Mannah, 6 - J Hayne, 4 - R Maitua, L Kelly, 2 - R Morgan. PEN: 8 - L Walsh, 7 - J Segeyaro, 4 - L Coote, T Grant, 3 - M Moylan, 2 - J Mansour, N Smith, S McKendry, 1 - S Manu, T Humble. SOU: 21 - G Inglis, 20 - A Reynolds, 16 - S Burgess, J Sutton, 3 - G Burgess, 2 - B Goodwin, 1 - N Merritt, B Te'o, I Luke. STI: 21 - T Merrin, 6 - J Soward, 5 - J Nightingale, 2 - N Fien, 1 - T Frizell, D Vidot. SYD: 22 - SB Williams, 18 - J Maloney, 13 - J Waerea-Hargreaves, 10 - M Jennings, 5 - S Moa, 3 - R Tuivasa-Sheck, 2 - B Cordner, J Friend, M Aubusson, 1 - M Pearce. WAR: 26 - S Johnson, 4 - K Locke, 3 - K Hurrell, 2 - S Mannering, 1 - F Mateo, M Vatuvei. WTG: 16 - R Farah, A Woods, 6 - B Marshall, 3 - C Lawrence, 2 - M Koroibete. Round 8 Votes + How Votes are awarded. This is how the votes were handed out for Round 8. 8 - G Inglis, 4 - J Sutton, 1 - S Burgess I Luke. 6 - J Reynolds, 5 - T Lafai, 3 - J Graham. 8 - B Ferguson, 3 - J Wighton, 2 - R Robinson, 1 - T Campese. 8 - M Scott, 3 - J Hayne, 2 - J Thurston, 1 - A Wintersein. 8 - S Johnson, 4 - J Idris, 1 - M Vatuvei F Mateo. 8 - L Lewis, 2 - A Fifita J Mullen, 1 - K Snowden J Robson. 6 - SB Williams, 4 - J Maloney, 2 - M Jennings J Waerea-Hargreaves. 4 - J Lyon B Lawrence, 2 - T Merrin K Foran, 1 - D Cherry-Evans J Taufua. You can follow the Votes live after each game via this Hashtag #NRLTweetPOTY and we publish all the Round Results in each week's Complete Set feature. 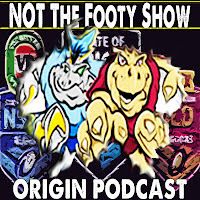 Admittedly only for a one-off State of Origin Special but after getting a lot of feedback that people had missed our combination of footy chat and I guess you'd call it 'analysis' - a few of your NOT The Footy Show regulars are reuniting on May 31st to produce an hour long podcast previewing Game 1 on June 5 at ANZ Stadium. We are not returning full time, this is just a chance to talk some footy with old friends and hopefully - remind you all of what you've missed! So keep an eye on @NRLTweet for more details, but the hope is to have DC Chapman, Jake Hauritz, Maria Tsialis, George Taylor, Nic McInerney and Matthew Duncan join host Warrick Nicolson for more NOT The Footy Show fun. The one-off Podcast should be available on www.wdnicolson.com and iTunes by early afternoon Saturday June 1st. 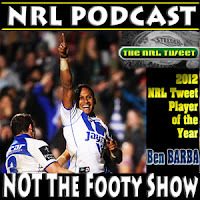 Share your thoughts on the footy by commenting below or replying on Twitter.